Growing up, there were always a few recipes my Mom kept on hand to cook week after week. They were simple, no-brainer recipes that tasted delicious and gave all the comforts of home. Nowadays, I’m on my own path, and still in need of those same kind of recipes, only more plant-based. Grain bowls are wonderful because they make anything into a meal, so I always keep plenty of grains around for meals. I recently started a more plant-based diet a few years ago after learning what happens to your body when you eat animal proteins versus plant-based proteins. I felt it in my own body what a difference it made and how happy my body is for it. I’ll admit it is still difficult for me to maintain a plant-based diet some of the time, especially when out socializing with friends. I created this dish by accident. 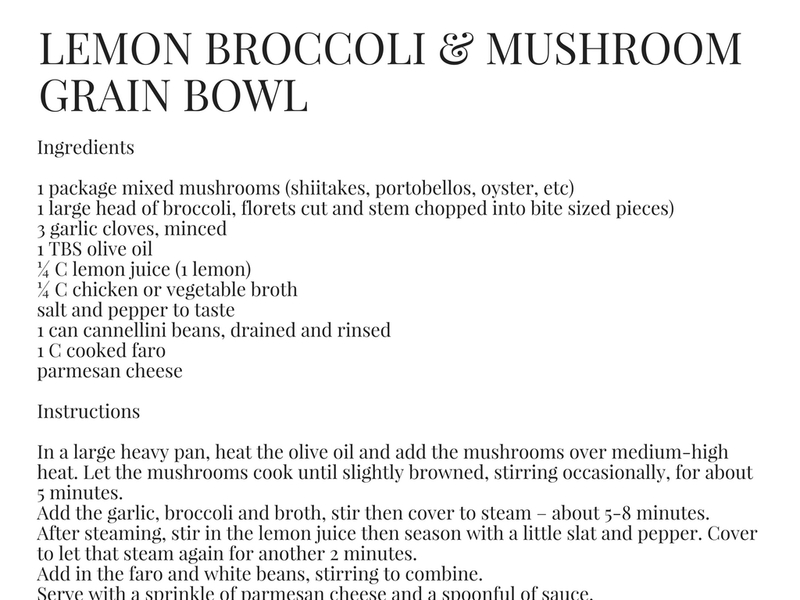 I always love to steam some broccoli and squeeze a lemon over it, so I thought, why not add in a few other ingredients I love and call it a meal? It was perfect – all the comforts of my Mom’s home-cooked Lemon Chicken dish yet almost completely plant-based. The cannelini beans added the right amount of “beef” to the dish to make it feel like a real meal, and the mushrooms and broccoli were a no-brainer. I stay “almost completely” because I used chicken stock instead of vegetable broth. I only used the chicken stock because I for one had it on hand and two it will always have a richer flavor than vegetable stock. By all means try this with vegetable stock and I know you won’t be disappointed, but using chicken stock is also a great way to ease yourself into a more plant-based diet. 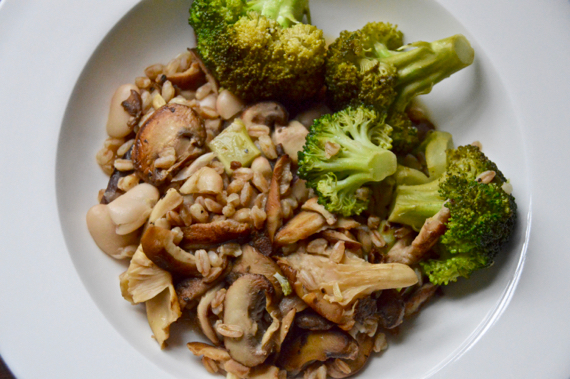 I used nutty, chewy faro as the grain in this dish, but barley, brown rice or quinoa could work too. I love the texture of faro though because of it’s more substantial thickness, chewy texture and ability to take on the flavors of the dish so well. Faro is also great for throwing into salads or soups as well. The sauce is simple: the juice of one lemon (about 1/4 cup) and another 1/4 cup of stock, plus some salt and pepper to taste. Just a little bit of garlic and olive oil are what get’s this dish going and by the end, it’s pure deliciousness. Healthy Tip: It’s important to buy your broccoli fresh and use it right away. 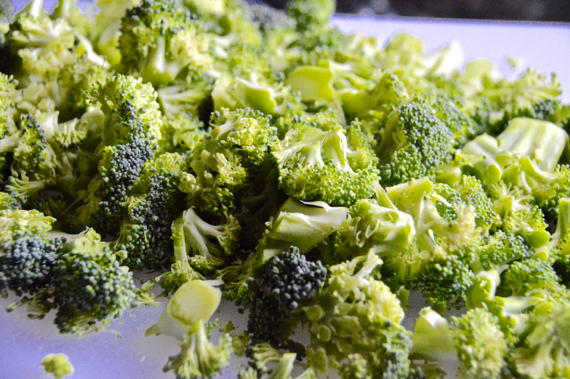 Broccoli quickly loses nutrients the longer it sits after being cut. You could also use flash frozen florets as well. When cutting a head of broccoli, cut the florets off first, then chop the stem into smaller pieces. So many people just throw the stems away, but they contain so many nutrients! It’s also a great way to not waste food! You can click the photo below or click here to print the recipe.